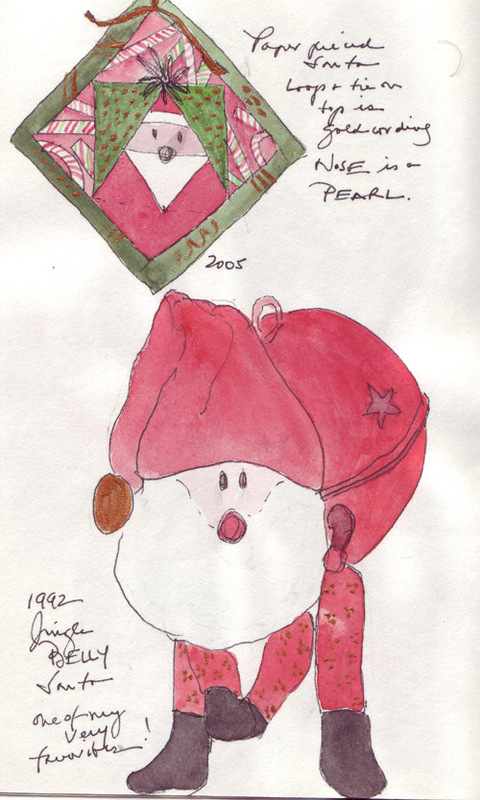 This 7th Santa is made on a large red jingle bell and is the family favorite. 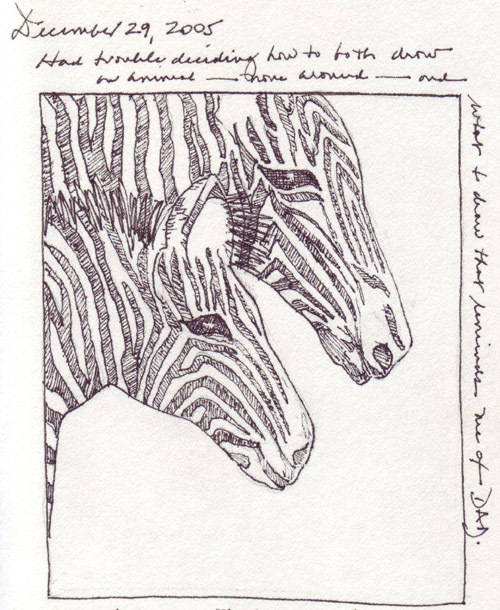 I had trouble deciding how to draw an animal - none around - and how to honor my Father. He was an amateur photographer during his retirement and I have several mounted enlargements in my apartment. I walked past this photo many times before suddenly realizing that it was perfect for EDM Challenges 20 (Draw something "Dad) and 44 (Draw an animal). 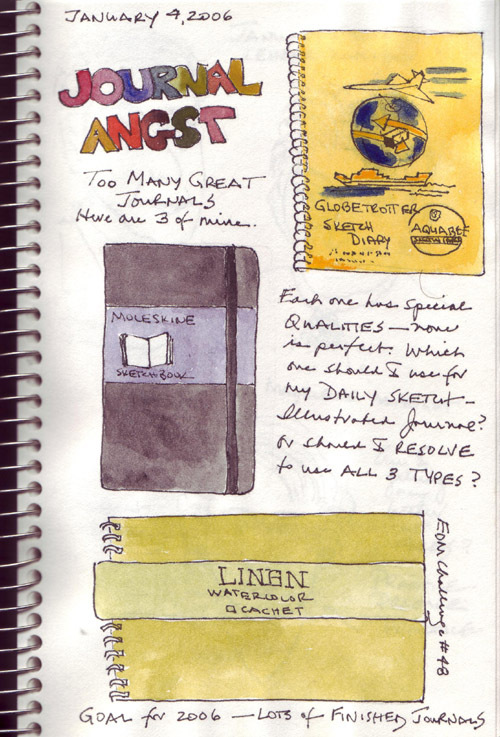 I would love to establish the habit of never going out without my sketch journal so I can draw daily throughout 2006. My current angst: which journal should I use? I regularly use the Aquabee sketch book because it is cheapest and I can add watercolor washes. I am just finishing Volume 3. I'm not inhibited by the journal itself and can therefore sketch freely. 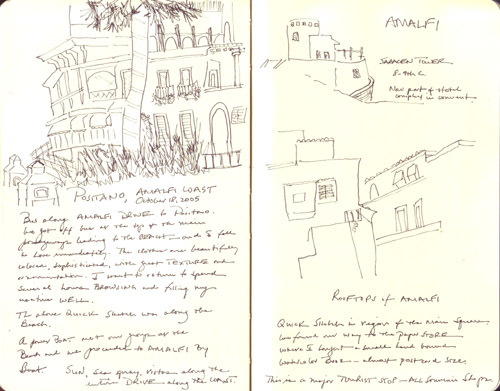 I loved using my Moleskine journal in Italy - the size was great for one page or doublepage sketches and it was easy to do fast sketches while standing because of the hard cover. But the pages don't take watercolor as well and they scan too yellow. I only filled half of Volume 1 in Italy and Volume 2 sits on my shelf. The Cachet watercolor journal is wonderful with its bright chartreuse linen cover and great watercolor paper. I have a purple one that I used intermittently "for special entries" since June 2003 and just finished it. But its specialness makes me more cautious, and that is stifling. My current thoughts: Use an Aquabee every day, take a Moleskine as a travel journal, and develop some of my fast sketches into "slower" sketches in the Cachet. The Amalfi Coast: We took a bus along the Amalfi Drive to Positano and then walked down the main stairway to the beach. I fell in love immediately with the Positano style: the colors, the textures, and the amazing design of the clothes that were displayed in all of the shops along the passageway. We had 10 minutes for coffee on the beach before our boat arrived and I sketched a few buildings on the edge of the water. We then cruised the coast to Amalfi and we walked so much in the main squares of Amalfi that I only had time for a few fast sketches. I did buy a wonderful small watercolor journal in the oldest paper shop in Amalfi. I loved Pompei! We had an excellent guide and I was able to stop for really fast sketches while he was talking. 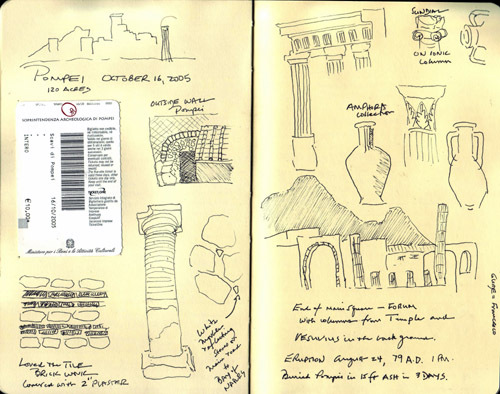 This is one sketchbook page showed my favorite view of the end of the forum with Mount Vesuvius towering in the background. I was constantly amazed at the sophistication of this civilization that was buried in 79 AD - especially seeing the wonderful mosaics and almost contemorary silver designs from Pompei which are on view at the Archeology Museum in Naples.